Awe-inspiring, beautiful and shrouded in mystery and history, Machu Picchu is a must for every adventurous spirit! 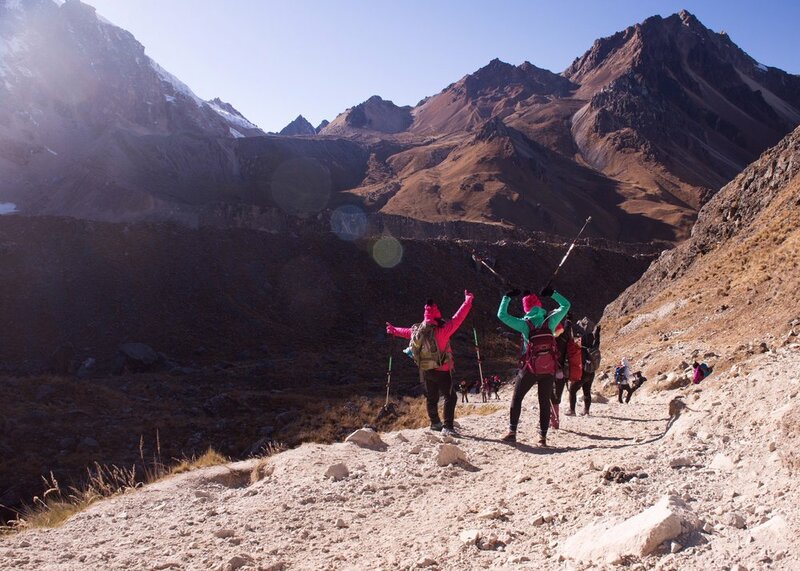 Join us and our amazing female led crew of local mountain guides for a body positive, off the beaten path trek through the majestic Andean mountain passes and lush jungles of the Salkantay Trail. After our 5 day hike, we'll arrive at the wondrous lost city of the Incas and explore parts of the ruins that few get to behold. Taking on this challenge with other like-minded and bodied women from the WHOA plus community will make this extraordinary journey that much more special! Arrive at the Cusco Airport (CUZ) where we’ll be there to give you a warm WHOA welcome and take you to the hotel. You're coming into a high altitude, 3,400 meters (10,498 feet), so it’s important to take it easy to let your body adjust throughout the day. Drink lots of water, coca tea (the locals swear by the stuff), and take the afternoon to rest and roam around the beautiful city that is Cusco. (We recommend hitting up the colorful, bustling San Pedro Market for an authentic taste of the Cusqueña culture.) At night we’ll meet for an authentic Peruvian meal (yum! ), meet our guides, and get briefed for our trek. We'll leave Cusco first thing in the morning and take a scenic drive through the Andes to Soraypampa - where our Salkantay trek to Machu Picchu begins! 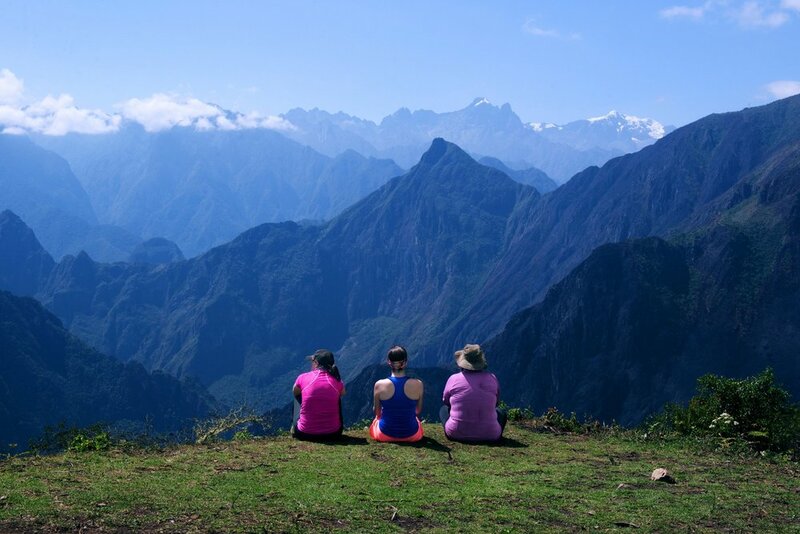 The Salkantay Trail is a custom-designed, off the beaten path alternative to the classic Inca Trail that provides more spectacular vistas, privacy and authenticity than the traditional route. Oh and, did we mention that National Geographic Adventure named it as the coolest way to trek to Machu Picchu?! After eating a homemade breakfast, we'll begin trekking to our first camp, Salkantaypampa (4,000 m), where we'll have the evening to enjoy the gigantic glaciers and majestic mountains surrounding us! This is one of the most humbling and physically challenging days, but it's also one of the most beautiful and rewarding! We'll reach the highest point on our trek, the Salkantay pass (4,600 m), as we hike between the Salkantay and Humantay glaciers. It's a long day, but there'll be plenty of time to stop for photo ops (and dance parties) before traversing the valley to camp. Bright and early, we will begin the day by hiking downhill, and pass by an Incan site (3,500 m), where we will stop and learn about its origins. We then will continue our hike along the Salkantay River, enjoying the increasingly lush vegetation, passing waterfalls, and the ever changing micro climate and flora and fauna before reaching our camp for the night at Collpapampa (2,850). The temperature will start to become warmer and our surroundings more tropical as we follow the trail along the Santa Teresa River. The contrast between this lush forests and mountainous peaks is one of the many reasons this trail will take your breath away! We'll be entering the "Ceja de Selva" (eyebrow of the jungle), which is full of colorful orchids, hummingbirds and flocks of parrots. At the end of trail we’ll be picked up and take a fun, panoramic drive to camp. 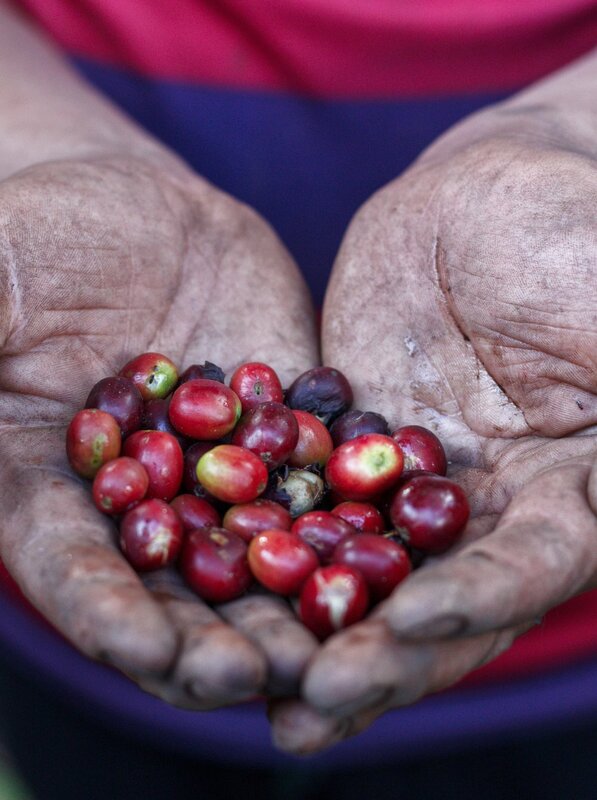 At camp we’ll have time to relax and tour a local coffee farm, complete with a tasting, before dinner. We'll pass through some avocado, banana and coffee plantations on the final leg of our journey to Machu Picchu. We'll start the day hiking up to Llactapata Ruins (2,650 m ), one of the most scenic spots on the trail! Once there, we'll have a break and listen to the history of the area while we enjoy a spectacular view, a sneak peak if you will, of the backside of Machu Picchu! We will then head to the Hidroelectrica train station for lunch followed by a short train ride back to civilization to spend the night in the town of Aguas Calientes. You'll have evening to recuperate, take a hot shower and roam around the charming town. We'll start very early, so we can experience Machu Picchu in the magical morning light of sunrise. You'll have time get lost in the Lost City of the Incas, and our guide will be on hand to tell you more about the fascinating history of this World Heritage archeological site. We'll also have the exclusive opportunity to take a unique day hike far above the ruins (3-4 hours), for the most breathtaking views of Machu Picchu. In the afternoon, we'll take a scenic train ride back to Cusco for the evening. At WHOA, every adventure is made more special by connecting and sharing adventure experiences with local women. Our last day in Cusco as a group, is all about reflecting, reinforcing and celebrating how special and powerful women coming together is! We'll begin the day with a visit to Mama Sherpa's village, Chinchero. 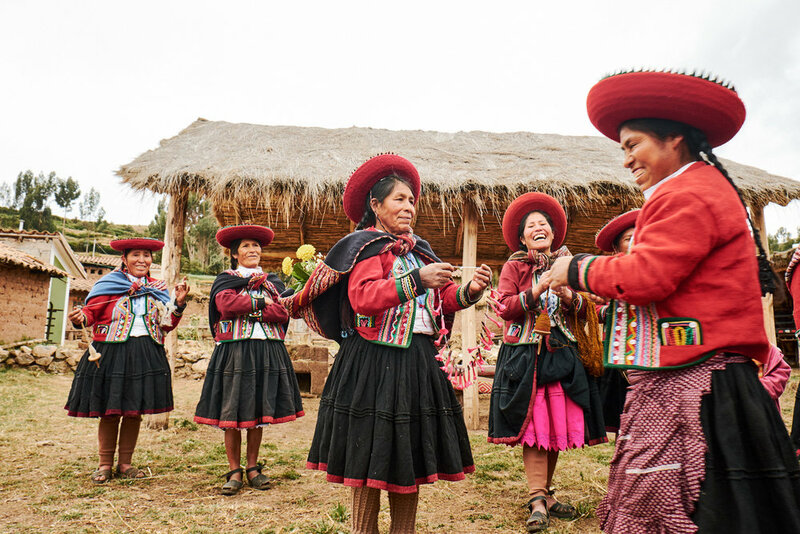 Here you will connect with the local women as they tell you how they have come together to use their skills to improve the lives of those around them. At night, we'll regroup for a celebratory dinner, and toast to the awesome adventure we all shared! We’ll say our goodbyes before you head home to the airport, or continue on adventuring!